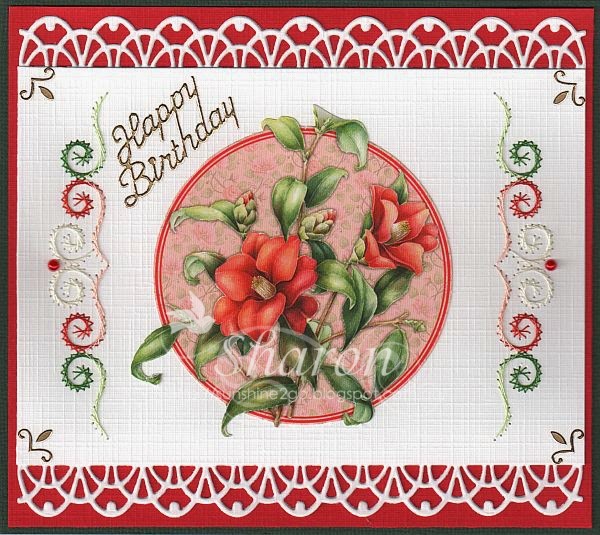 I have been busy with the new Stitch-a-Card, pre pricked toppers by Ann's Paper Art. 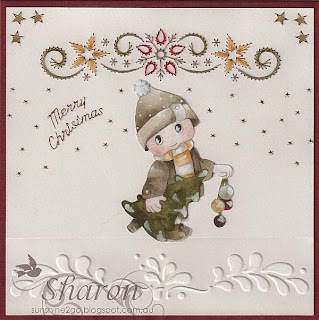 I have created new 2 Christmas cards from the set. 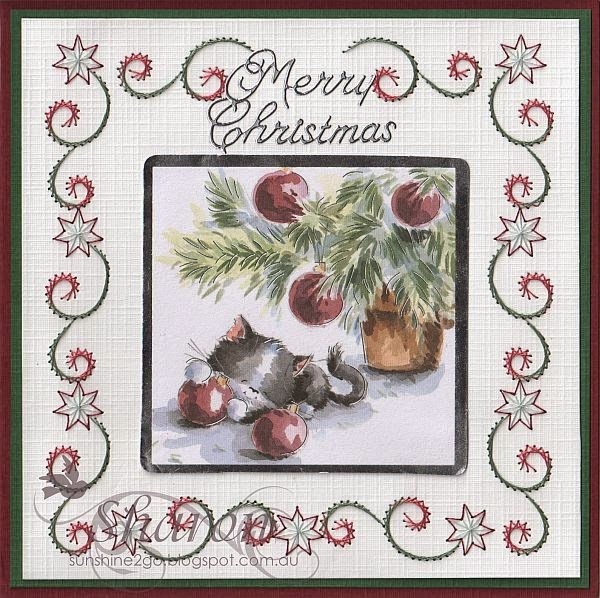 The first Christmas card is Stitch a Card a351. Threads are Mettler Polysheen 0824, 1913, 3842, 6133. I added red Hobbydots #4 around the edge. 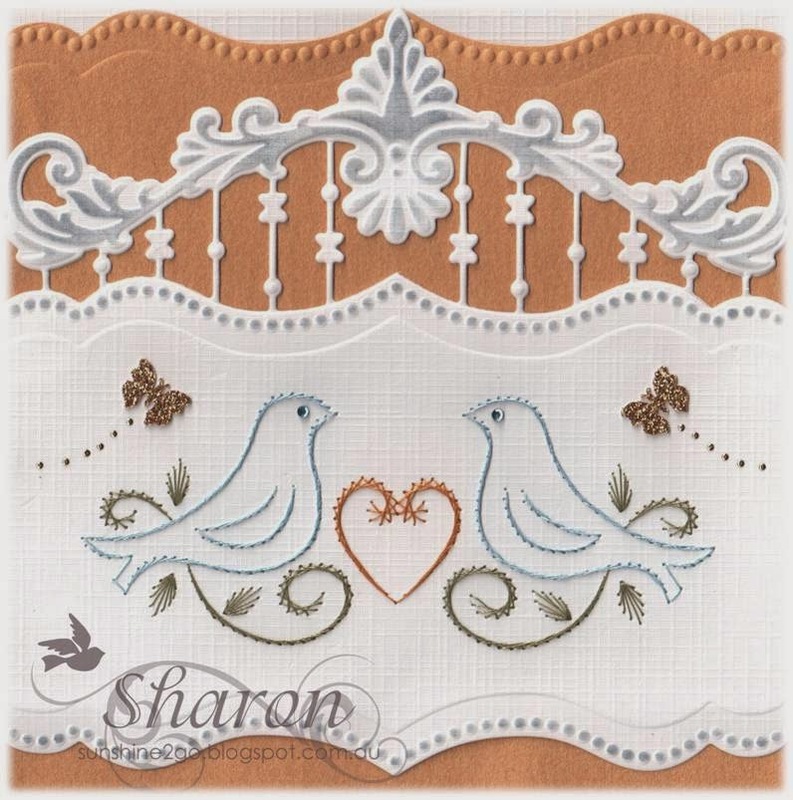 Gold hobbydots have been added using the shape from Marianne Design LR0300. The stickers are by Starform 873,8522. 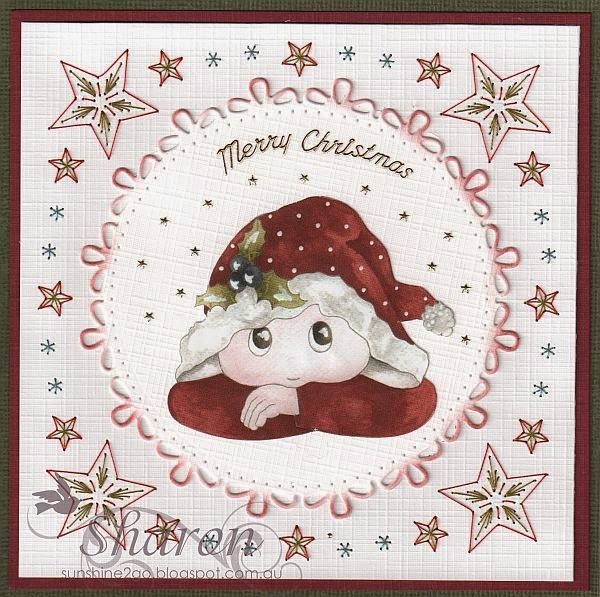 The second Christmas card is Stitch a Card a659. Threads are Mettler Polysheen 0453, 0622, 0862, 1913, 6133. 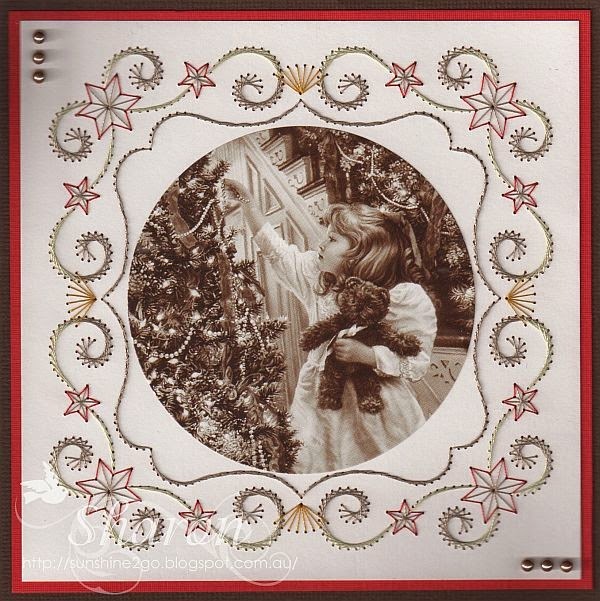 The decoupage is Precious Marieke CD10381. I am addicted to Marieke's decoupages........lol...... I love them all. 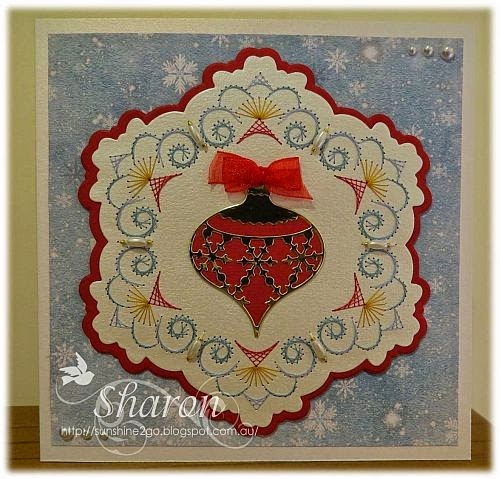 Leane Creatief "Boarder drops" makes a lovely edge at the bottom of the card. Stickers have also been added. In the last few weeks I have created 2 birthday cards for men. The second card is for Pieter who lives in South Africa. 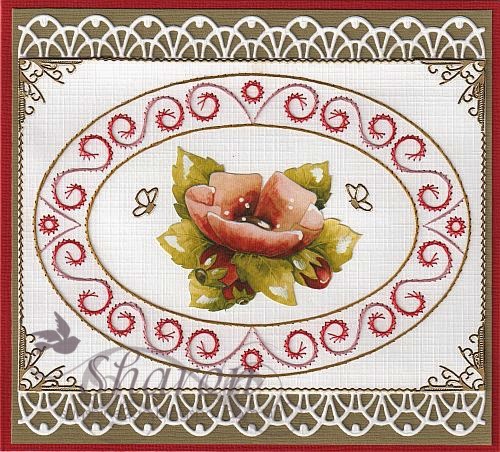 The pattern is a049x-a and is also available from Ann's Paper Art webshop. Both of the images are from Lili of the Valley "Jack, Patch & Puss"set 2. 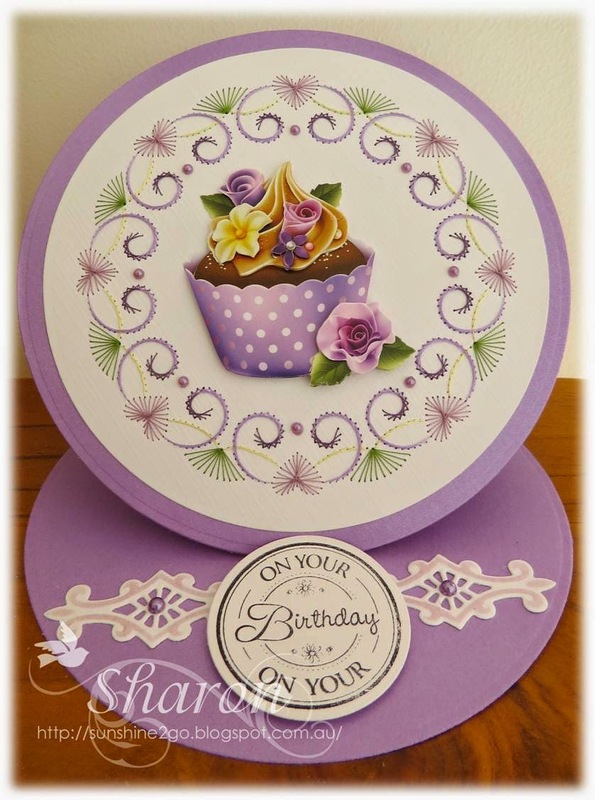 This month I created a card for Eva, the pattern is a690 which Ann created especially for the Nellie Snellen SGD001 die and is available from Ann's Paper Art webshop. Although you can also stitch the pattern without using the die. 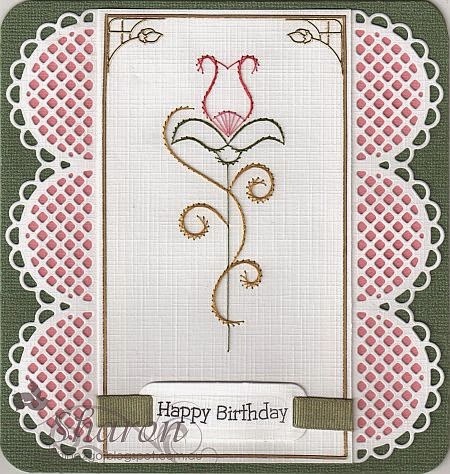 Ann has also created some cards to show you using this wonderful set. Threads are Mettler Polysheen 2920,3030, 3040, 5650. Butterfly is by Joy! Fantasy Butterfly 6002/0245. 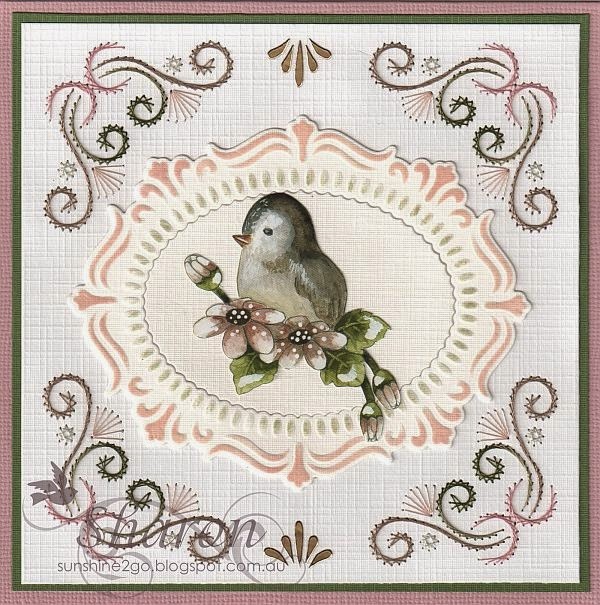 Scrapbook paper by Marja Design "Vintage Spring Basics"
I am looking forward to creating more cards with this lovely pattern and die. 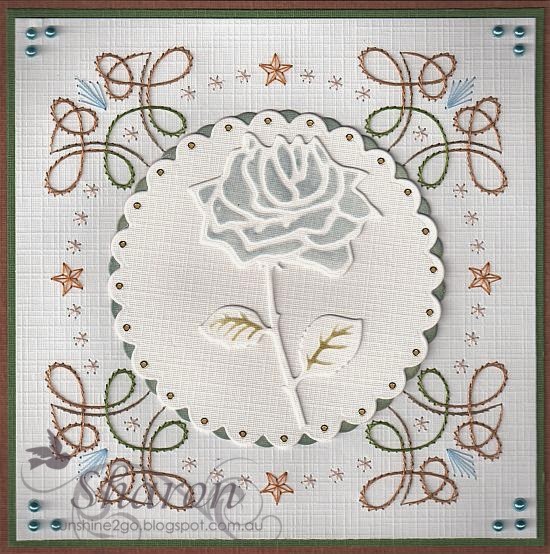 This month Ann is releasing "pre-pricked card toppers"for all of those people that would love to stitch a beautiful card without having to prick out the pattern, It is a fun and quick way to create a card without the worry of pricking. 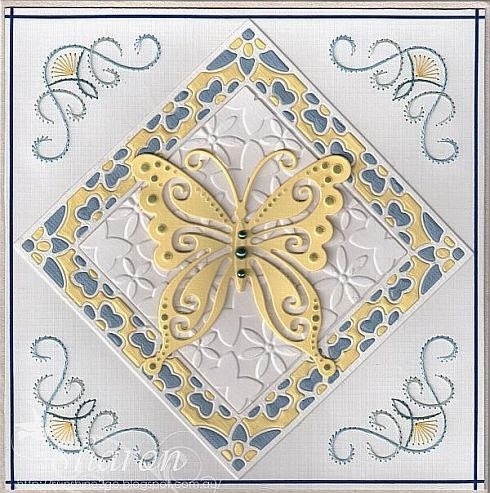 There are 6 patterns available from Ann's Paper Art. 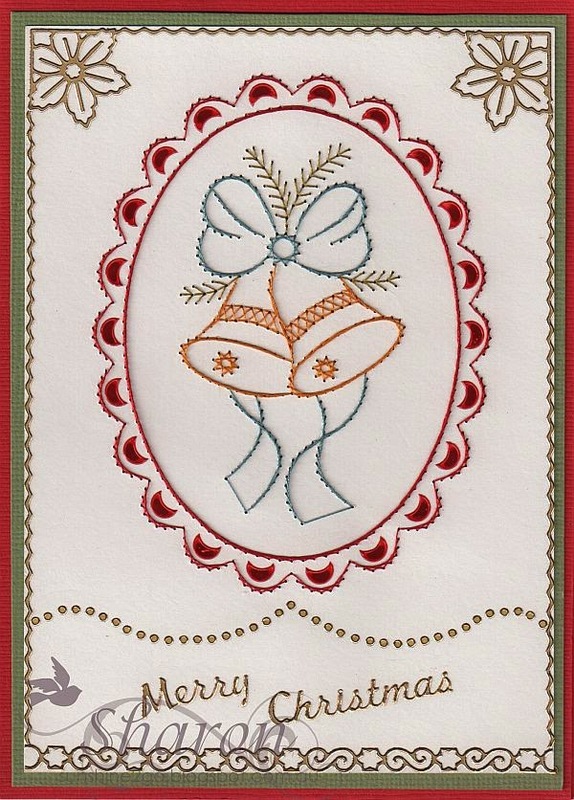 I created a card for a new baby with "Stitch a Card" a447. The die is by Joy! 6002/0253 I added some distress ink "Tattered Rose"onto the embossing. I added some cute little butterflies and peel off stickers to finish the card off. The decoupage is by Precious Marieke. CD10415. I hope that you enjoyed looking at the new cards that I have created. Today I finished 2 Christmas cards, I am well on the way now although I still have many more to complete. The pattern is a new one by Ann's Paper Art the pattern is a689. Threads are Mettler Polysheen 1514, 6133,3842. Presious Marieke range.....sheet number CD10381. All the images on the sheet are very cute. 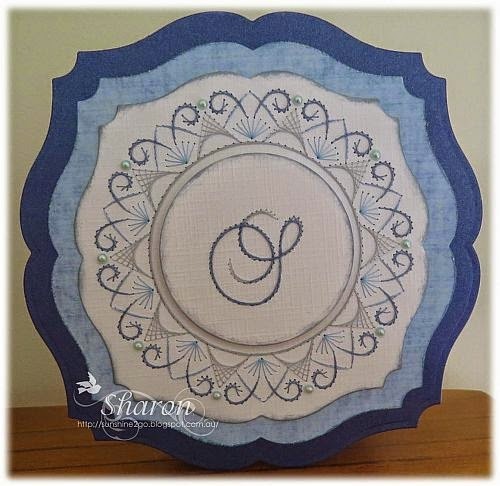 The circle die is by Marianne Design CR1248 I added "Aged Mahogany" distress ink around the edge. Stickers, Merry Christmas and stars have also been added. 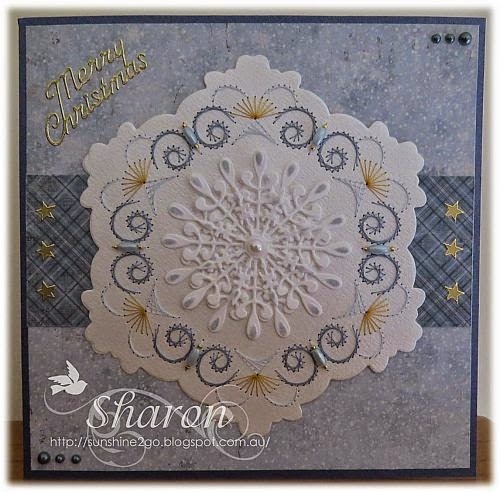 Another beautiful Christmas pattern by Ann's Paper Art I have combined 2 patterns on this card a667 & a415. Threads are Mettler Polysheen 0861, 1061, 1514, 6133. 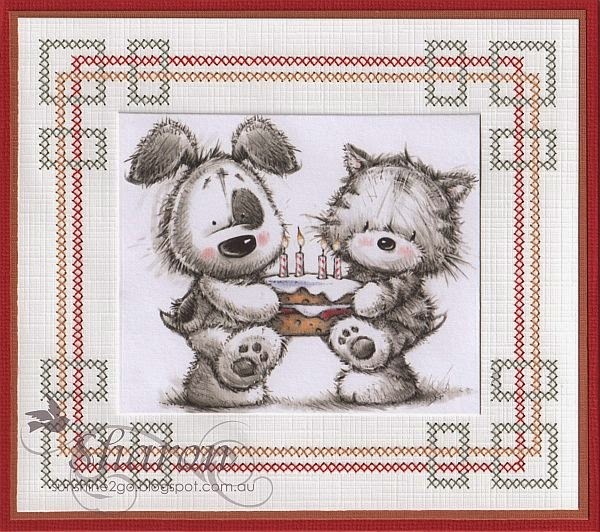 The image is also from the new Precious Marieke decoupage, CD10381. The die is Marianne Design CR1250 which has also has "Aged Mahogany"
distress ink around the edge. Merry Christmas sticker has also been added. I hope to have some more Christmas cards to show you shortly. 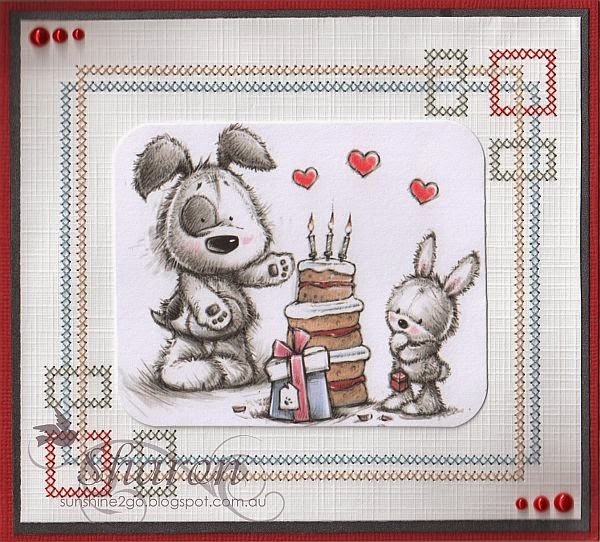 It was Karin's birthday this week and this is the card that I created for her special day. 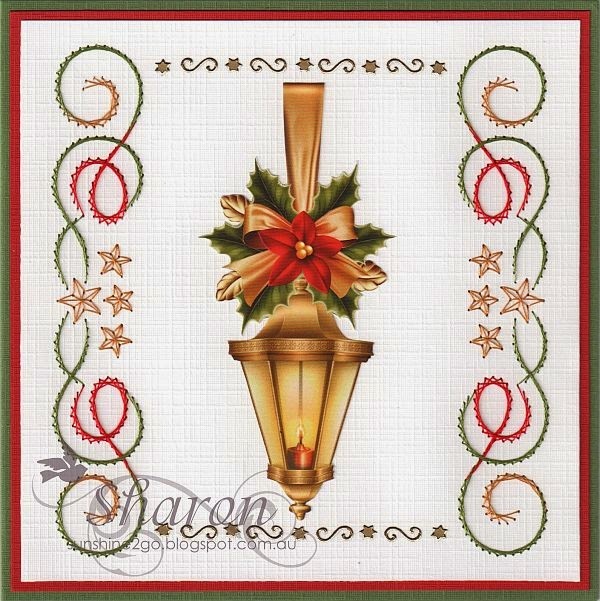 The pattern is a656 and is available from Ann's Paper Art webshop. Threads are Mettler Polysheen 0700, 2764, 2905, 3251. 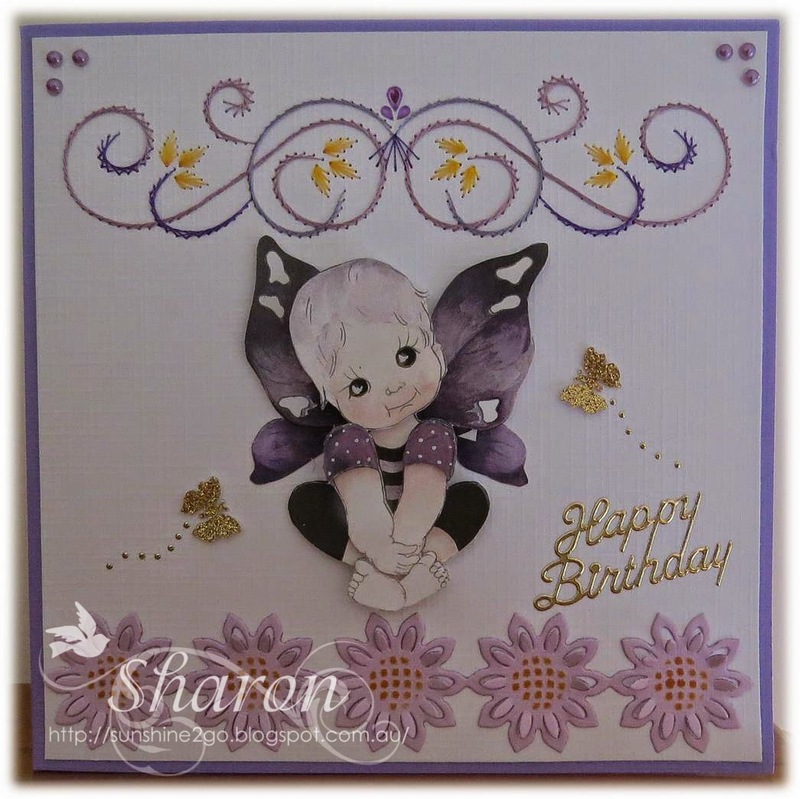 The embossed centre of the flowers have been inked with Tim Holtz "wild honey"
Butterflies, hobbydots and pearls have been added to the card. Today I thought that I would share with you all a picture of 2 juvenile King Parrots. 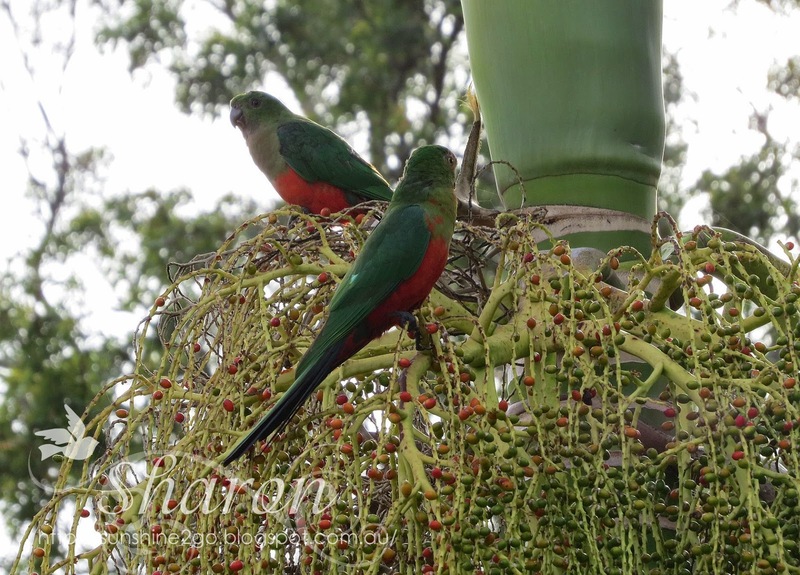 They are busy feeding from a Alexandra Palm not far from our back door. At the moment the garden is a birds paradise with all of the flowers out. 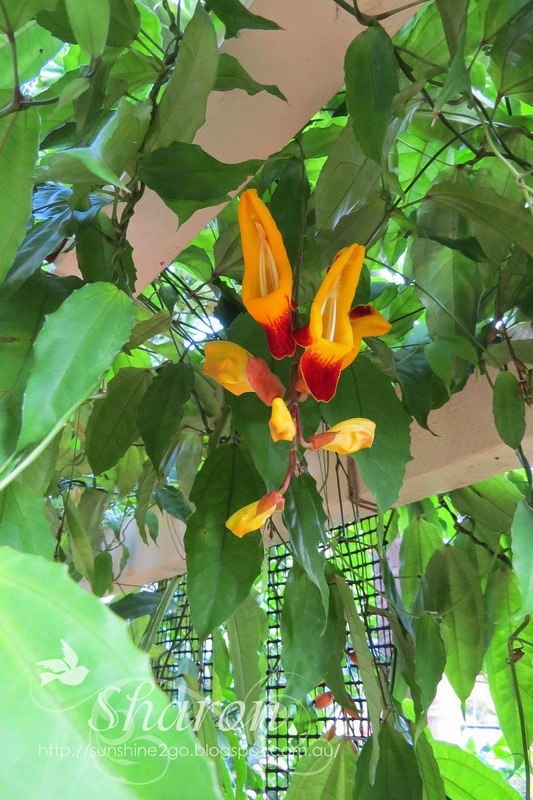 Last year we built a arbour and planted the "Thunbergia Mysorensis" common name is "Lady Slipper Vine" The flowers are magnificent. The arbour is nearly all covered with this beautiful vine. I hope that you enjoyed looking at the photo's. 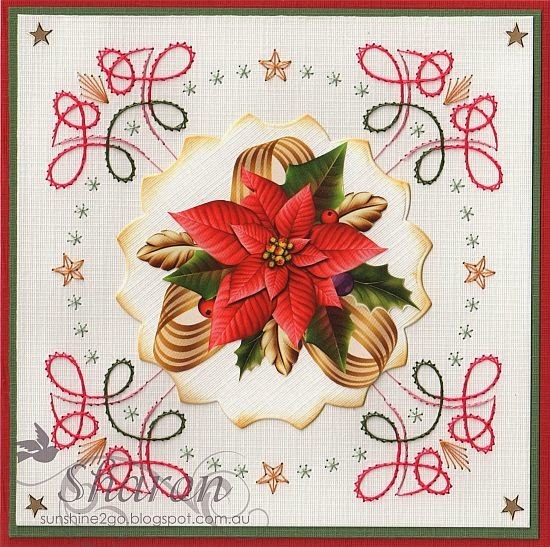 a pattern from Stitching Sheet book #22 by Ann, which is available from the webshop. Threads are Mettler Polysheen 0270, 1335, 1351, 5633. 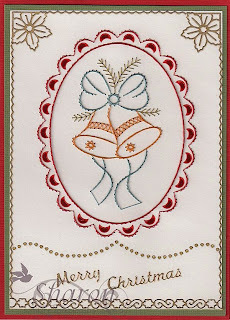 Once again I have used the beautiful new Vintage Border die by Joy! 6002/0366. The decoupage is by Janneke Brinkman 269. Stickers and gems have been added. 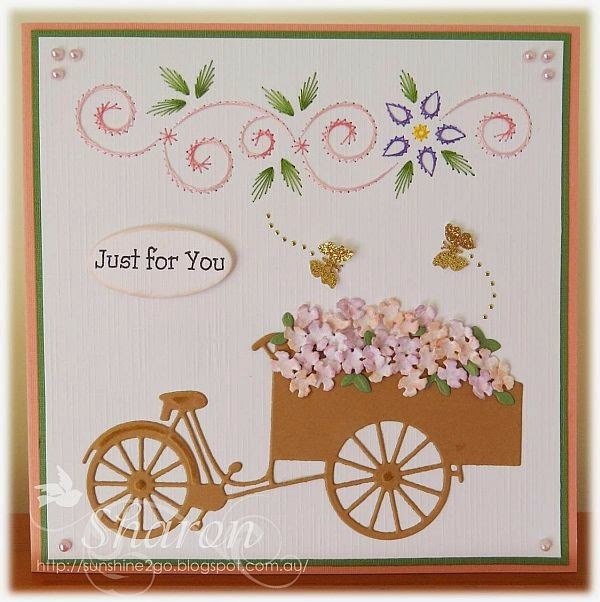 This is such a lovely bright cheerful card and I had lots of fun creating it. Threads are Mettler Polysheen 0442,0546,1725,2052. The die is Joy! Vintage Boarders 6002/0366, I love this new die and it has become one of my favourites, it makes a lovely edge on a card, I seem to be using it quite a bit lately. Today I have a birthday card to show you all, the card is for Kerstin. 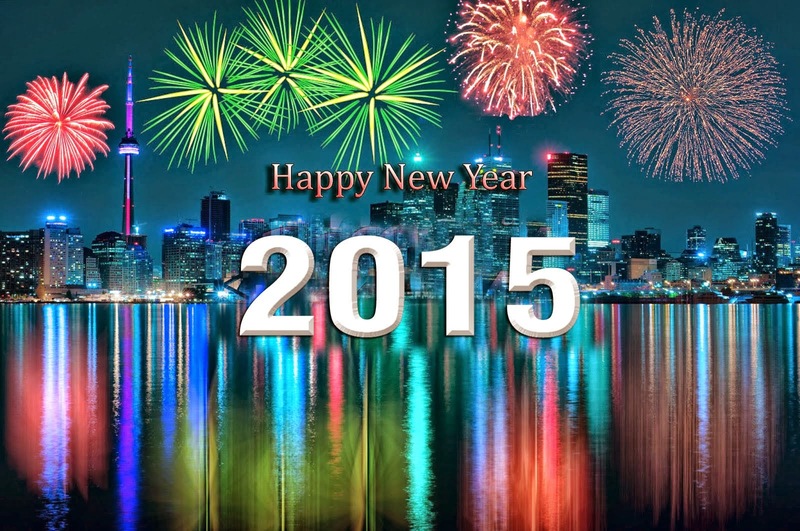 I have been very busy creating cards but am unable to show them to you yet. 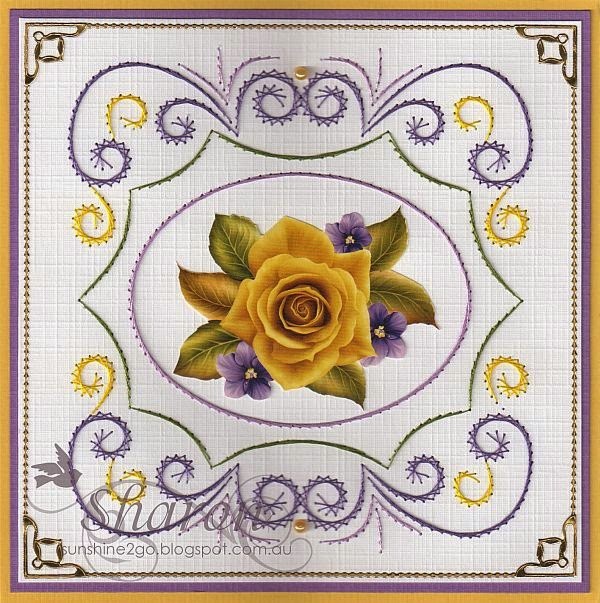 The pattern is a681 and is available from Ann's Paper Art webshop. Threads are Mettler Polysheen 0170, 0453,0862,1761,2051,5934. I distressed the edges with Tim Holtz Tattered Rose and Bundled Sage. The decoupage is Marieke 2591. I will have some Christmas cards to show you all soon. Don't forget to look at Ann's webshop as she has lots of wonderful new things in stock.